The W10172T2 is one of Cartier's Must 21 series model. 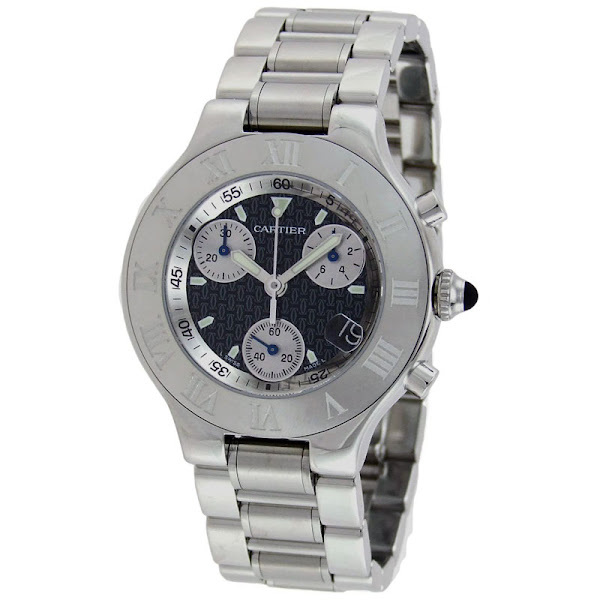 An elegant Swiss chronograph that is simply a must have for watch-loving men. This Swiss made Cartier watch features an elegant scratch-resistant sapphire dial window and a black dial adorned with a subtle Cartier double C motif. Its handsomely crafted 38.5-millimeter case, bezel, and bracelet are featured in a high quality stainless steel. Furthermore, the W10172T2 model wristwatch's dial has three sub-dials for its chronograph functions with 30-minute, 60-second, and 1/10th second subdials, plus, date window at 4 o'clock with magnifier. There are Roman numerals that revolve around the fixed bezel, while its steel crown at the 3 o'clock position is adorned with a black rubber cabochon. Powered by Swiss quartz movement and featuring three luminous sword-shaped metal hands, this luxurious timepiece is also water resistant to 330 feet. You can find an original Cartier W10172T2 Watch at the site(s) listed above. However, we don’t guarantee its availability as being listed here simply means that those site(s) has the item in question by the time we wrote the review. The review in this page is written by garnish at Monday, September 26, 2011. The post is tagged as analog, cartier, men, sapphire, watch.